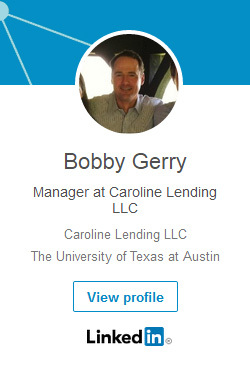 Caroline Lending was founded by Bobby Gerry, who began as a real estate investor in the late 2000s. Prior to working in real estate, Bobby ran an investment partnership in the Mosbacher family office in Houston, Texas. Caroline Lending began operating in 2012, in a cubicle on the fifth floor of Boxer Property’s real estate acquisitions group in Houston (just outside of Andre Pereira‘s office). Andrew Segal (founder of Boxer Property) encouraged Bobby to start the company directly inside Boxer and provided a nice cubicle :) Soon Bobby outgrew the cubicle and Andre Pereira made Bobby get a real office and become an actual paying tenant of Boxer Property. Andre helpfully later encouraged (bugged) Bobby to hire people, and today Caroline Lending continues to look for energetic, motivated people to join our company. Caroline is named after Caroline Wiess Law, a great lady who was a benefactor to the city of Houston. Bobby was born and raised in Houston and attended the University of Texas where he received a Bachelor of Arts degree. Click on image below to go to Bobby’s LinkedIn page.